I loooove baby cakes – they are soooo cute and fun to make especially because you’re making them for a sweet, little baby! So when I heard that our family friend had a baby boy I knew I was going to make a cake. I decided this a day before I needed the cake so I needed something simple and cute that would be a big hit! I came up with this cake design! Its great for baby showers or any baby celebration! Lets start with the best part…the adorable elephant! 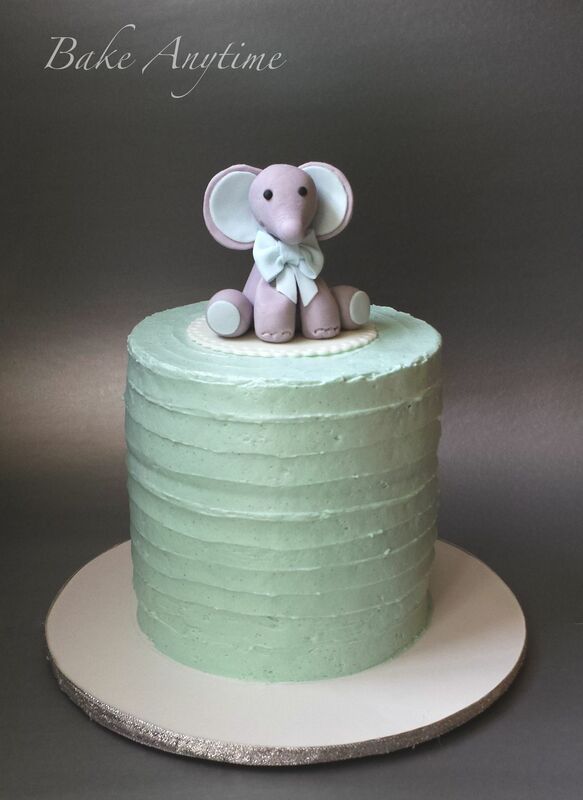 The baby elephant was made with a 50/50 mix of fondant and gum paste. I followed this video which makes it really easy to model the figure – its basically a bunch of different shapes stuck together. The only change I made was that I attached the legs with half a toothpick. I made the elephant the night before I used it, but you can make it more in advance. Just make sure that you insert a toothpick into the bottom before it hardens so that it can be secured into the cake. I was still able to stick the toothpick in to it the next day because it was not very hard but it was firm enough to stand upright and not be easily reformed. For the cake, I started with five 6 inch cakes. Each was a little less than 1 inch high. For a 6 inch cake I like to put support and a board halfway between the layers because otherwise it gets very tall and wobbly and it doesn’t cut properly. Start by placing your first cake layer on a thin cardboard cake circle the same size as your cake layers. Try to use your thickest cake layer on the bottom because it usually gets squished from everything on top and will get thinner. Spread a layer of frosting (I used swiss meringue buttercream) and place your next cake layer on top. Repeat this with one more cake layer. Then crumb coat the whole thing and place it in the fridge for a little bit to firm up (about 15 minutes). Next you have to add some support. I like to use bubble tea straws because the cake goes right into the straw and doesn’t push out the cake which causes bulges in your cake and that’s a big no no! Just stick the straw flat side down into the cake and cut it to size. I used five straws for this because a 6 inch cake was going on top. I usually use one less straw than the size of the cake going on top. After that, place another same sized cake board on top. Then start stacking the rest of your cake layers. I did two cake layers but you can do three if you’d like. Crumb coat the top cake and let it set up in the fridge again for a few minutes. Once it comes out of the fridge you’re going to put a thick layer of frosting all around the whole cake. Don’t worry about it being perfectly smooth but try to make it nice and even. You can put your cake on the board you will be serving on now or after its done – its a personal preference. Make sure your cake is on a turntable (I like this one because it is affordable and does the job very well) and then you’re going to take a small angled spatula and starting with the bottom you’re going to hold the spatula against the cake and turn the turntable until you come back to where you started. Then you repeat this on top of each indentation layer until you get to the top. Make sure to overlap each indentation level for the rustic effect. For the top of the cake start on the outer edge and turn the cake while you bring the spatula closer into the center. You can watch this video for a good idea of what I’m explaining. I do the sides of the cake in separate indentation levels as I explained, while he does it in one circular motion going upwards but its the same idea and a great video! The doily was made with a frilled circle cutter and then I used a piping tip to cut tiny holes near the edge. Before you place the decorations on the cake, make sure the buttercream is firm enough that it won’t be squished. 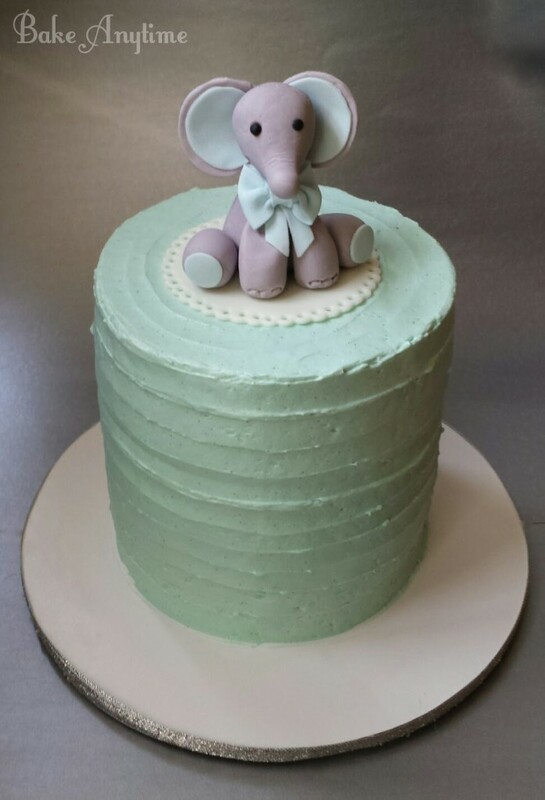 I also placed one straw for support under the fondant doily and the elephant which I secured on the cake with a toothpick. Enjoy! If you have any questions please ask!